Liberty has been designed for the independent entrepreneur. You receive the benefits of flying the Liberty flag without being subject to complicated rules and restrictions. Our distributor agreements—offered for a three-year term—are easy to read and easy to understand. The contrast with those of the major oil companies couldn't be more dramatic. Once you've signed, you'll find Liberty easy to work with. We've done everything we can to streamline our administrative procedures, and we do our best to accommodate individual circumstances. There are few markets as volatile—or as complex—as the world's energy markets. If you're in the fuel business, you know that the right information at the right time can have considerable impact on your margins. But you also know that keeping a close eye on market dynamics while managing your company can be difficult. When you're a Liberty distributor, you never have to worry about missing a critical change. We send market updates to your inbox several times a day as needed—and we do so without charge. We not only post prices. We track market trends, distill the top-level information, and tell you where we think the market's heading. Our goal is to give you the insight you need to make better decisions, every day and over the long term. In rural areas, distributors may be given exclusive markets. 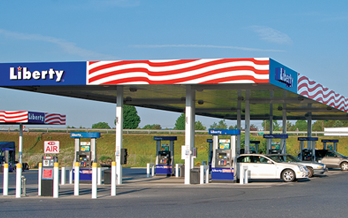 In metropolitan areas, Liberty management guarantees a minimum one-mile distance between Liberty-branded stations. We make it easier for you to run a successful business.